A B-KIS describes the Bee-keeping sector’s Knowledge and Innovation System in a country or region. It is a way to rather quick get a structural overview of main actors and their relationships, methods used, and specific roles, among other things. You might do such an analysis when you want to get a better understanding of pre-conditions and potentials for communicative interventions for change within the sector, but also to better understand what might be lacking in order to strengthen the sector in your country or region. This is a short version of the method, which of course could be done both more thoroughly and scientifically. The suggested approach is based on your and some colleagues/partners existing knowledge and experience of the bee-keeping sector. It is possible to develop this description and preliminary analysis in 3 hours more or less. If you do it with a mix of stakeholder it will become a much richer picture, why a workshop format with 6-8 participants is the best approach. So what is this B-KIS all about? Well, it is an established way to describe and compare the different knowledge and innovation systems. In different countries we have, by tradition or by political reasons, chosen to organize knowledge development and dissemination in different ways. In Europe there are some common threads as well as important difference when looking at, for instance, the agricultural sectors. Many of you that are working within the bee-sector in Europe are well aware of the differences between our countries, but it is often described more systematically. The Smartbees-project has done it within one of its workpackages, and a summary of findings could be found here: länka till dokumentet/texten “Analysing the B-KIS in Europe_an overview” . The challenges to develop the bee-sector and to become more innovative differs between regions and countries in Europe. 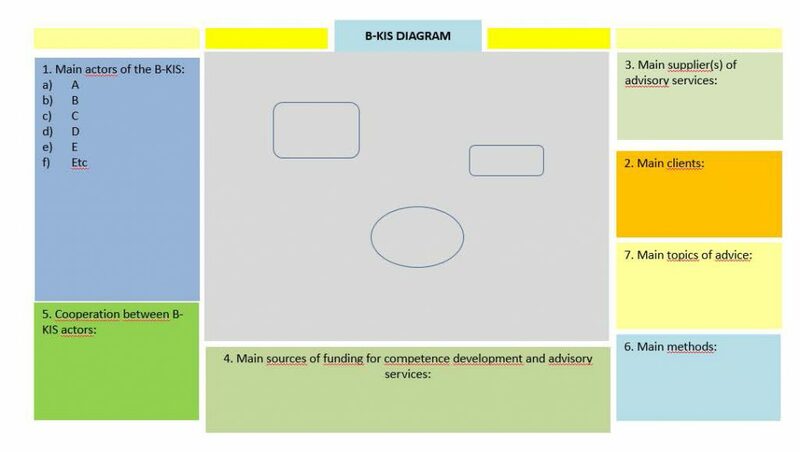 In some countries we might lack state support for competence development, in other advisory services and in another a lack of vertical or horizontal cooperation to use existing potentials, etc. By comparing B-KIS we will be able to suggest adapted strategies to strengthen the knowledge and innovation system. In total app. 3 hours workshop. You can end the activity by illustrating the B-KIS in the middle of the template. Depending on how used you are in doing this, it takes different long time. For inspiration of some different ways of doing it, take a look at the document “Analysing the B-KIS in Europe_an overview”.